These words summarize what we do, but the men and women of St. Tammany Fire Protection District No.1 embody this mission on a daily basis. Each day we make a difference; responding to the needs of the community, regardless of the nature of the incident. Our goal is to restore order to chaos. Our personnel specialize in Structural Firefighting, Emergency Medicine, Vehicle Extrication, Hazardous Materials response, Urban Search and Rescue, Swift Water and Flood Rescue, Rapid Diver Operations, Wild Land Firefighting, Emergency Management, Strategic Planning and Incident Command. The majority of our incidents involve medical emergencies; therefore, each member of the department is trained to a minimum of Emergency Medical Responder. The majority of our personnel are trained to a higher level than the minimum required EMR certification and are Nationally Registered Emergency Medical Technicians. Additionally, we have an Advanced Emergency Medical Technician and several members that are Nationally Registered Paramedics capable of providing advanced level prehospital care and we continue to strive to train members of our department to increase the number of Paramedic Engine Companies available to serve the needs of our citizens. 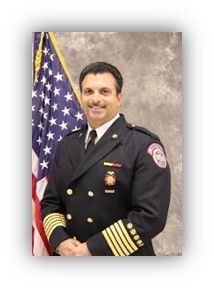 As the Fire Chief of St. Tammany Fire Protection District No.1, I am proud to represent such a fine organization. I am impressed on a daily basis with the compassion and resourcefulness of the men and women of our Department and their commitment to the residents, businesses and visitors of our Fire Protection District. As we move forward, we will continually seek ways to re-think how we provide our service in an effort to be more efficient, more adaptable and more responsive to the needs of our community. On behalf of our Board of Commissioners, the men and women of St. Tammany Fire Protection District No.1, myself and my staff, we commit to you that we stand ready to assist you in your time of need day or night, with integrity, compassion, professionalism, respect and dignity. St. Tammany Fire Protection District No.1 is here for you! P.S.-Did you know that roughly half of all home fire deaths result from fires reported between 11pm and 7am when most people are asleep? Smoke alarms save lives!!! Having a working smoke alarm cuts the chances of dying in a reported fire in half! Please check you smoke alarms monthly. St. Tammany Fire Protection District No.1 is proud to be a part of the Louisiana State Fire Marshall’s “Operation Save-A-Life” again this year providing smoke alarms to vulnerable citizens and at risk communities in our area please contact our Fire Prevention Bureau for more information at (985)646-4387.